Recently I saw an article in the Sunday Times written by Gabrielle Monaghan. It was great to read something more positive than the normal doom and gloom that is seen in our daily media reports thanks to our current economic crisis. Gabrielle wrote about the Mount street club Trust. It origins and how it contributes to building and improving our community. The Mount Street Club was established in Dublin in 1934. Its aim at the time was to give the unemployed the chance to work in return for food. As our state improved and social services increased unfortunately the mount street club services became more and more redundant. However more recently the mount street trust has put forward new incentives to help tackle current difficulties in our communities. It now hopes to offer the employed an opportunity to get involved in growing their own again. They hope to do this through allotments and community gardens as part of €330,000 project. The mount street club trust is using money from the 2006 sale of its former headquarters to fund the project. They are offering up to €10,000 in grants. Community gardens have been invited to apply if they involve the unemployed in the planting, growing and harvesting of food. As part of the new scheme, gardening experts from Grow it Yourself (GIY) a charity established last year will provide groups with access to unused land or local authority plots. The fund is being distributed be the community foundation for Ireland. Welcome to Polydome’s new blog. We are delighted to be finally online. Over the coming months we hope to use this source as a means to sharing with you our experience in the greenhouse industry. 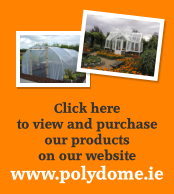 Over the past 25 years Polydome has become one of the largest suppliers of hobby polytunnels and glasshouses within Ireland. We now hope to pass on some of the knowledge and expertise we have gained over the years. We hope this information will help anyone making the next step in purchasing or making their own greenhouse. Welcome to the Polydome blog. We hope you will gain inspiration from the information we publish. Click here to go to our website.